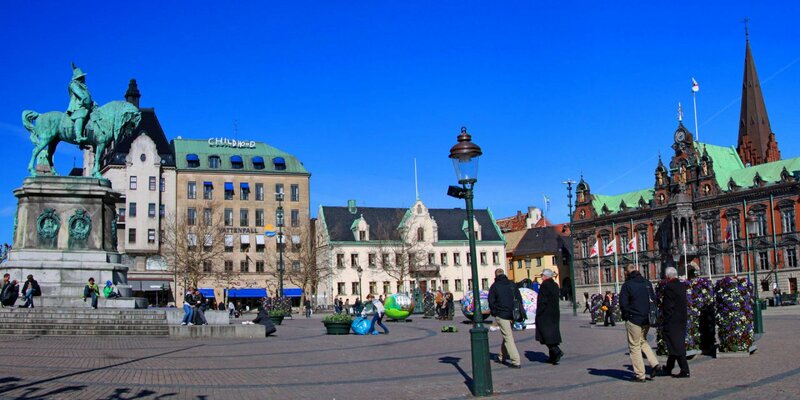 The Gustav Adolfs Torg, called Gustav by Malmö residents, is the second largest square in Malmö and is located at the southern end of the old town Gamla Staden. 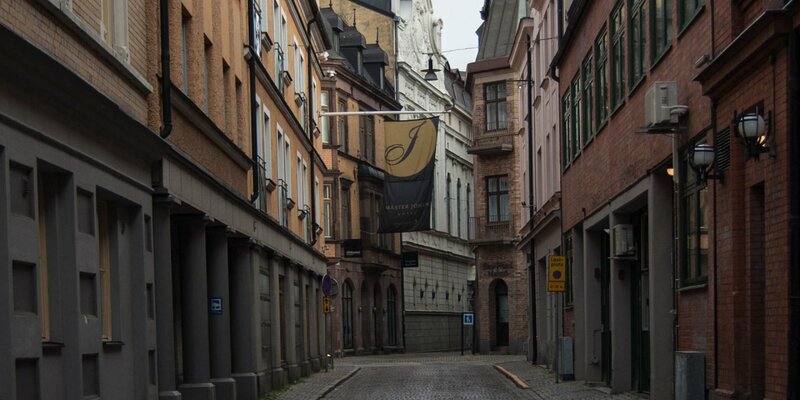 The central shopping street Södergatan leads from here through the old town to the Stortorget 400 meters away. 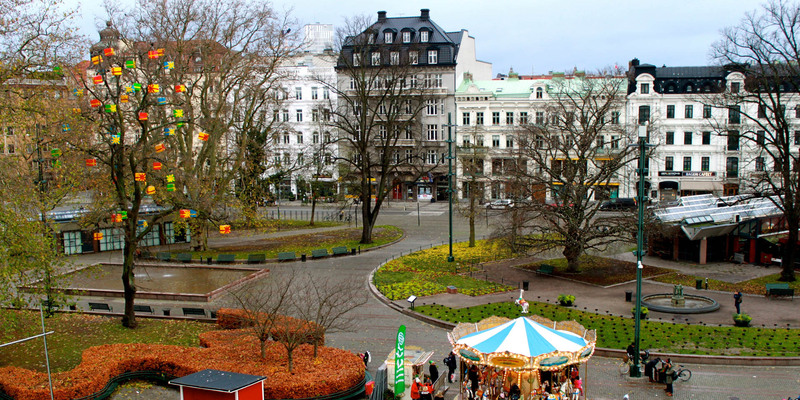 The 15,000-square-foot area of the Gustav Adolfs Torg is decorated with groups of trees, hedges, a lot of benches, a small lawn, sculptures and decorative fountains. On the circular pedestal in the center stands one of the favorite sculptures of Malmö, Lekande barn (Playing children). The sculpture was created in 1913 by Anders Jönsson and shows three children who are grouped around a small fountain. Under one of the groups of trees is the large fountain Öresund. The work with water fountains and two life-size bronze figures comes from the hand of the Swedish/Danish sculptor Gerhard Henning and was inaugurated in 1934. On the east side of the square is the artwork Fem fontäner och ett klot (Five fountains and a ball). This work was created in 1999–2000 by the artist Sivert Lindblom and consits of five high columnar bronze fountains and a large ball. The paved area of the square is regularly used as a marketplace and for events such as the annual Malmö Festival. The buildings around the square consists of multi-storey buildings, some with nice architecture dating back to 1900s. Only separated by the large central bus station, west of Gustav Adolfs Torg begins the old cemetery of Malmö with its big old trees. Further to the west, the cemetery adjoin to the channel and the spacious Kungsparken. King Gustav IV Adolf, who had a special interest in the development of Malmö, decided in 1804 to demolish the old city fortifications, to drive the development of the city ahead. During his reign, Malmö was Swedish capital over a short period of 6 months, as Gustav Adolf resided in the city from November 11th 1806 until May 11th 1807. 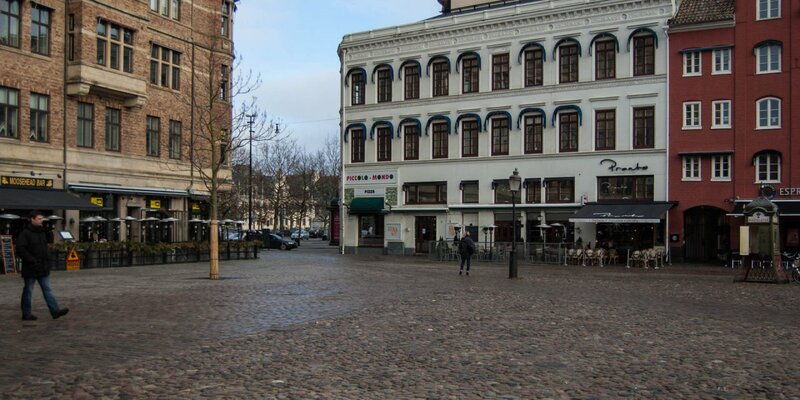 As part of the renewal, the ramparts of the todays old town were removed, new quarters, avenues, channels, and also the Gustav Adolfs Torg as a prestigious square for the new district, were constructed. Until the beginning of the 20th century, there was no artistic decorations on the court. The first item was the fountain with the sculpture Lekande barn which was donated in 1914 by Malmö paint dealer Eugén Wingård. The big fountain Öresund was installed in 1934 and then from 1999–2000 the Fem fontainer och ett klot. From 1906 until its final closure in 1973 the square was the main junction of the tram.